I found Blu when he flew into our outside bathroom (June 2011) and we bought him a cage and then we got him some company, his mate jewel from the pet store. He is my first pet ever. 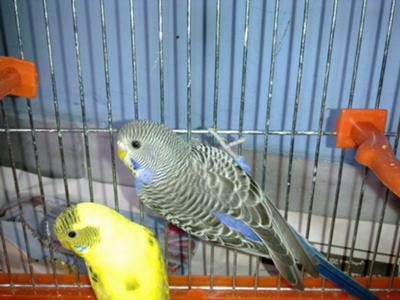 The blue budgie looks like a cobalt normal. It may be a different shade of blue but is definitely the normal variety. Take a look at the page about varieties to see more examples of normals. I found my budgie on my neighbors car! !But I love him the same.You budgies adorable.